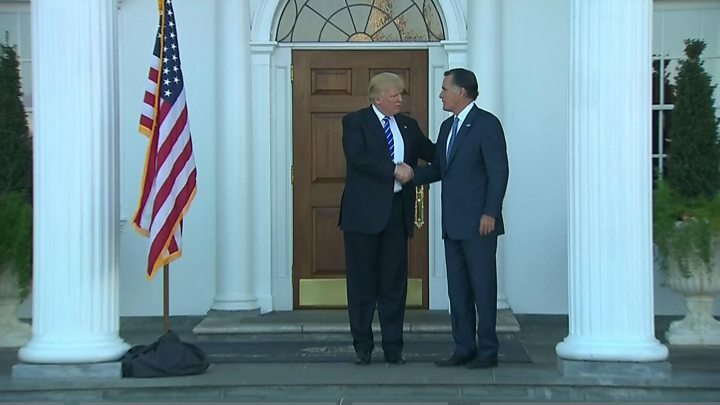 US President-elect Donald Trump has met one of his fiercest critics, Mitt Romney, with reports suggesting he may be considered for secretary of state. Neither man gave details of their 80-minute meeting on Saturday. Mr Romney said the talks had been "far-reaching". During the campaign, Mr Romney called Mr Trump a "fraud", while Mr Trump said Mr Romney's unsuccessful presidential bid in 2012 had been "the worst ever". Mr Trump has settled several posts so far, a number of them controversial. Lt Gen Michael Flynn, the new national security adviser, has drawn concern over his strident views on Islam. On leaving Mr Trump's golf course in Bedminster, New Jersey, Mr Romney did not answer questions on whether he would accept a cabinet position, or whether he still thought his host was "a con artist". He said only that they had held a "far-reaching conversation with regards to the various theatres of the world" in which the US had an interest. Mr Trump will conduct more meetings with potential appointees at the golf course over the weekend. 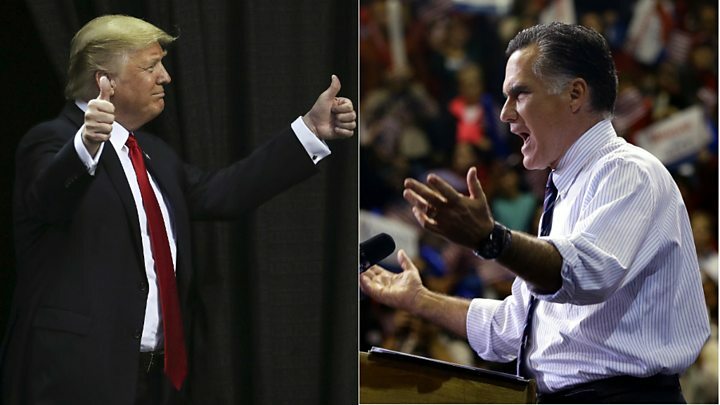 In March, Mr Romney said Mr Trump had neither "the temperament nor the judgement to be president", accusing him of bullying, misogyny and dishonesty. "Prospects for a safe and prosperous future are greatly diminished" if Mr Trump became the nominee, he said. Mr Trump responded by mocking Mr Romney, calling him a "failed candidate" and a "choke artist". However, US media suggest the role of secretary of state could be up for grabs. In the past, Mr Romney has taken a far more critical line on Russia than that suggested by Mr Trump. Separately on Friday, Mr Trump settled three lawsuits for fraud brought against him over his Trump University. Media captionDonald Trump's lead attorney in the cases Daniel Petrocelli said Mr Trump wanted to "put aside this issue - and get it behind him"
He tweeted on Saturday that he had settled "for a small fraction of the potential award because as President I have to focus on our country". In settling the class-action lawsuits, Mr Trump "was willing to sacrifice his personal interests, put this behind him, and move forward", his lawyer said. Mr Trump had been sued by former students who paid $35,000 (£28,000) for property "secrets" from his "hand-picked" instructors.